Children's theatre is a unique offshoot of normative theatrical practice. The dependency on conventional narrative delivery is lessened and the performance instead employs a looseness that allows for, say, the introduction of a rapping explorer in comically over-sized glasses. Scottish Youth Theatre's Family Storytime shows are aimed at children aged between 3 and 7. At such a young age it goes without saying that much of the traditional ways of consuming theatre -sit quietly in the your assigned seat- has not yet been engrained onto their psyche (although this reviewer finds them better behaved than a lot of adult theatre audiences...). The gang over at Family Story Time realise this and not only do they offer a colourful, engaging and easy to follow story but they present the children with opportunity after opportunity to get involved in the story. This current season of Family Storytime are all based around the timeless fables of Aesop (each season is based around a different theme; we have recently had fairy tales, rare tales etc.). Aesop's fables survived for two connected reasons; their brevity and their strong morals. 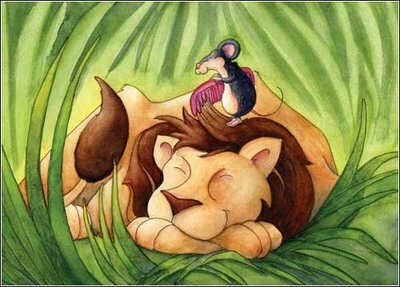 This makes them perfect fodder for the Family Storytime treatment; in this weeks tale The Lion and the Mouse they spend 20 minutes of their 45/50 minute show simply taking a tour of the 'safari'. The children were -of course- on board the bus the entire time. It is telling that it is the product of a Youth Theatre; that inherently understands what children want, which is simply to run around and make noise. What better opportunity to do this than by encouraging them to pretend to be monkeys? A constant musical rhythm is maintained throughout the entire show that keeps the involved in the changing plot, although they may have to stay pretending to be those monkeys, they have got to get back on that bus, as the song (and the show) must continue. This is maintained throughout the entire performance; sure, the songs change but the beat is constant. At moments were there was a threat of disengagement from their audience, the performers are well trained and canny enough to realise this and engage with them on a one-to-one level. For instance, one child who did not involve himself with any of the interactive elements was asked (along with several of the other children, he was not singled out) what animal he was. His response to this was 'An evolved ape' which, whilst being a particularly smart answer, nonetheless demonstrates an involvement with the text on display. Family Storytime is an innovative and engaging way to introduce children to theatre, with 5/10 minutes at the end of every performance dedicated to the children storming the stage and 'playing' (in the theatrical sense, perhaps?) with the props. Each and every show not only presents a fun story for kids to enjoy but also encourages imaginative thought and, importantly, an introduction to the art of performance. Sean is a member of SYT's Young Reviewers group. A group of young people who study theatre and they are passionate about performing arts for children and young people. If you want to take part or to find out more, you can email kyriakosv@scottishyouththeatre.org.